Asphalt Flower is packaged in a sleek, portable roll-on dispenser of shaded gray glass. It looks androgynous and urban, and it smells that way, too. Yes, there is a candied-violet note in the opening phase of the fragrance’s development, but within a few minutes, it’s surrounded by dusky swirls of incense. Some powdery iris and heliotrope notes emerge a little later, and they flirt with the violet and incense but never dominate the composition. The longest-lasting part of the fragrance is a smoky-sweet blend that stays close to the skin. The patchouli note is just a faint murmur under the floral-incense notes, and the vanilla doesn’t appear until the final phases of the fragrance’s development. MAC is known for its predilection for vanilla — its lipsticks, in fact, are vanilla-scented — but there’s not enough sugariness in Asphalt Flower to turn it into a gourmand violet along the lines of Alexander McQueen’s MyQueen (which I remember enjoying, although I must have been in the minority, since it was discontinued so quickly). If Asphalt Flower were an item of clothing, it would be something like a basic black sweater: simple, gender-neutral, and casual in a modern way. Despite its poetic name, it’s not necessarily a “statement piece.” If Serge Lutens’s variations on woody violet are too dense (and costly) for your taste, or if you liked the idea of Love in Black but you were put off by Creed’s pretentious image (and, again, the price tag), Asphalt Flower may appeal to you. I personally prefer Sonoma Scent Studio’s Voile de Violette, which is a bit more mysterious and has better staying power, but Asphalt Flower still appeals to me. It’s surprisingly unisex for a fragrance that you can find at a department store, it feels suitable for autumn, and it’s reasonably priced — not so cheap per milliliter, if you do the math, but still less than a luxury lipstick or any other must-have fall accessory. MAC Asphalt Flower sells for $20 for 6 ml at MAC cosmetics counters and boutiques, or online at the MAC website and Dillards. Note: top left image is Crushed violets by oksidor at flickr; some rights reserved. This appeals, as does the gray-blue-plum makeup palette. Perhaps a stroll to the MAC counter is in my future. Hi GG, I always like to check out the MAC counter, and they have a few good collections right now! I’ve never really tried their perfumes, however, so this one was a nice surprise. Maybe I shouldn’t check out anyone’s makeup collections at this point, however, as a glance at my own bathroom drawers and cupboards tells me that I should be listing stuff on *bay. A look and a sniff, that’s all. . .
GG, Same here… yes indeed! Unfortunatelly, none of their scents have good staying power (i’ve tried them all, since I am an MAC fan anyhow), so the whole thing turns out to be rather costly in the end, calculating the number of times you have to re-apply and mm in the vial or bottle). Make-up is very good though, especially glosses and lipstics, + a huge pallete of eyeshadows in any color known to man. Mascaras are nothing much and it’s a pity. Thanks, Dory! I remember MAC having another violet scent at some point… Violetrix?… and a rose scent, but they’re long gone. I do own and love a couple of MAC lipsticks. Pragmatic, That is such a wonderful, fanciful shoe! I wish I had the life (and the bank account) for it! I think I’ll check this out today- I’m going to the mall anyway I have MAC’s Naked Honey, and really like it. It’s nothing earth shattering, but the warm “honeycomb” smell is very pleasant and restrained. I use it as my comfort scent, to wear around the house and before bedtime. Marsha, It’s hard to find a nice honey scent, so that sounds like a find! I think I sniffed the two honey scents very quickly when they came out, on one of those days when I tried everything new at Macy’s… I should have given them more attention! I had all but dismissed this one…sounds like I should at least give it a sniff after all. Thanks! Boojum, Yes, why not? Easy to check out, no loss if you don’t like it. Nice review! I’m looking forward to trying this — it sounds very nice for fall, and at any rate I’m a big fan of the basic black sweater. Hi Jill, I guess we’re all a bit jaded… hee… but for a women’s scent you’d find at Macy’s or Dillard’s, it’s interesting! Definitely not a fruity-punch-floral, at any rate! Hi Jessica. Nice review. I may seek this out and, if I like it, pick it up for a “cheap” thrill, even though the per-ml price is pretty doggone high. I’d like to compare this to Soivohle Purple Love Smoke, which captivated me with its quirkiness last fall and is still somewhere on my bottle lemming list. It’s a smoky, mysterious violet worth checking out. Hi Joe! I haven’t tried Soivohle’s Purple Love Smoke, but I do like Cassis et Violette from the Soivohle Studio Collection very much… more of a dark-berryish violet with a gourmand touch. Oh, drat, I just went by the MAC counter today and I knew there was something I wanted to look for. Sounds pretty interesting. Hi Tama! It’s only been out for about two weeks, so you should still be able to find it. It’s actually easy to miss, since it’s so dark and narrow… it’s just tucked into the display for the Fall /09 Trend mini-line! Hmm, I thought SSS was just about the most realistic or perfect violet soliflore ever, and probably the shortest-lived, to boot. What makes you think it mysterious? Hi Jianhuang… Maybe “elusive” is a more accurate description? I don’t think it’s as straightforward “violet” as Annick Goutal’s La Violette or something like Devon Violets; I can never quite put my finger on some of the secondary notes… cedar? bergamot?… that keep it interesting for me. I tried this a few weeks ago (and managed to score a bottle of Naked Honey on the same day), but it didn’t really work for me. It smelled really harsh and tar-ry on me – I never really got any nice smoke to it. Next time that I’m by the Mac counter, I’ll give it another try and see if I pick up anything different from it. Heck, it took me 30 years to appreciate No. 5, so a second sniff is never out of the question. Hey, you scored, getting one of those limited edition Honey scents! As for Asphalt Flower, it’s definitely not the same caliber as No. 5… hah… but at least it’s easy to find and re-test if you feel like doing so! The SA disinfected the rollerball mechanism with rubbing alcohol before I tried it – I wonder if that has anything to do with how it turned out on me? I’ll definitely try it again because I’m seriously regretting passing up grabbing a second bottle of Naked Honey and might stop by and see if they have any left. Probably not, but you never know. Plus, I can always hit up the SAs for more samples and try A Scent on skin – finally. Oh, those MAC salespeople and their rubbing alcohol! How funny. No one minded when I used it directly on my arm… maybe my local Macy’s isn’t very hygiene-conscious! lol – I did try it at Saks, so maybe that’s it. I’ll go to Macys or Dillards for the retry and maybe they won’t be so worried about my hygiene. you are lucky to get some naked honey! i read the review here recently, tried a sample (thanks misskittyv!) and all the MACs/Nordstroms are out and they are going for $100+ on ebay! No way – it’s nice, but it isn’t that nice. Somebody posted in another thread that if you call Mac and ask for the Gone, but not Forgotten department, they’ll hook you up if they have any. Somebody on another blog was able to track down a bottle that way. Good lord! I had no idea Naked Honey was so desirable ; ) I just bought it for a cheap thrill during my weekly shopping stroll. I might swing by Belk’s again to see if they still have it, because at $30, I like it a great deal. 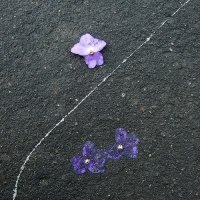 I did get the Asphalt Flower. Again, another cheap thrill. The opening “inky” note is pleasant, and I can carry it in my purse for necessary touch-ups. I also like that it’s small in quantity. I can use it up quickly and add it to my MAC recycling bin. Perfumes like Asphalt Flower have been useful to me at work. Since it’s cheap, but not a fruity floral, I’ve been able to slightly sway some co-workers into considering wearing perfume without spending a lot of money. Plus they liked the roll-on bottle.